There is a lot of confusion in the personality community about what intuition is and what it isn’t. Some people I’ve met ascribe planning for the future to intuition, when in fact many sensing types also enjoy planning for the future. Other types consider intuition to be almost psychic or empathic. To help clarify the cognitive functions (and whether or not you use them in a primary position) we’re going to talk about the different ways they can show themselves in your life. We’ve already discussed introverted feeling, extraverted feeling, introverted thinking, and extraverted thinking. Now we’re going to move onto intuition and sensing. 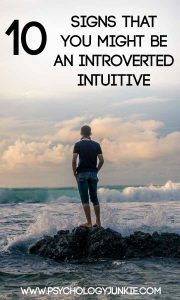 If you relate to the 10 manifestations of introverted intuition in this article then there’s a good chance you’re an NJ personality type. If you’re unsure, you can check out the 10 signs of extraverted intuition (the function NPs use). INFJs and INTJs show the most effective and pronounced use of introverted intuition (Ni for short), while ENFJs and ENTJs also have strong use of Ni because it’s in their auxiliary position. ISFPs and ISTPs enjoy using Ni as a “relief” or tertiary function. This means during stress-free times in their life they may be able to harness it quite effectively, however they will usually prefer the world of sensing to the world of intuition. In the same way ESFPs and ESTPs can us Ni occasionally, but will prefer the world of sensing first. can be very helpful. Feel free to share your thoughts in the comments!